Consulting on an unusual estate recently, I was informed there were 7 beneficiaries, 4 of which were also co-executors. Can you imagine that many co-executors? What a nightmare! This estate also had personal property, which the family felt to be very valuable, but it wasn’t. There was a bunch of land to be divided, or sold and divided among the children. Naturally, when you have that many cooks in the kitchen, everyone has different thoughts and opinions. This is why co-executors is not necessarily a good choice. In my opinion, estate settlement is much harder when you hand decisions to people who can’t come to a conclusion and end up fighting, or potentially going broke doing so. Some wanted the land intact; others wanted it subdivided. You can see where this story is going and it isn’t good. The siblings had indeed reached an impasse. One long distance heir, who had little to do with mom while she was alive, was the first to get an attorney involved, then everyone else followed suit. It just gets messier from there. I have been doing this for a very long time; I hope you don’t think I’m crazy when I share with you that people and their behaviors are getting worse. Their behavior is often out of control, along with other emotions, sometimes even getting physical. It makes me wonder. What on earth could be so grand that it’s worth destroying themselves, as well as other relatives and relationships? Don’t these people know they are going to have to carry the burden of their decisions for the remainder of their lives? I’d love to have a slice of land or the proceeds from it. But not at this cost. It just isn’t worth it! The attorneys will do their jobs well, and whatever inheritance there is will dwindle with legal fees. Interesting observation: While the inheritance is decreasing, the emotions and angst will only increase and be prolonged, sometimes for the rest of the lifetime, long after the estate has been settled. Is there anyone to blame in this scenario? Fingers can be pointed all day long. In the end, it comes down to the original decision maker who did not specify what should happen to the property and named so many co-executors. Big mistake which caused even more strife for those left behind. I ask you plainly … Is it really worth it? I couldn’t possibly make this stuff up! Recently, I was asked to handle the daunting task of emptying a hoarder’s home. The home owner had passed away in the home. The sole heir, who lived several states away, required assistance to identify items of value, discard tons of garbage, sort through the piles, etc. The heir’s goal was to empty the home so the real estate could be sold. For anyone walking into this home, myself included, it would be considered an overwhelming situation, let alone for an heir who has no knowledge of how to proceed. I agreed to do the job. We went in and systematically approached the entire estate, attacking the most dubious areas first. Handling a hoarder’s estate is, quite literally, an archeological dig. We unearth one layer at a time. We work through the system, we follow the proper process that we have perfected, we sort as we go, and we report back to the heir/executor what we find. In short, if there is something of value hidden, we will find it for the family. Sadly, much of what we find that used to have value no longer has value, because it has been destroyed from being buried for decades, exposed to critters, relentless fungi, deterioration, etc. I don’t mind sharing with you that this was a grueling job, even for this professional with decades of experience. Progress was slow since the home was in very bad shape with rodent nests and “evidence” of them, and the home smelled. Naturally we took all health precautions, but it is difficult especially early in the process because there is no room to sort, organize, etc. Room by room, we used the same method; over the course of 9 days we found some pretty spectacular things. Our systematic approach might seem overkill to some, but had we not taken our time to go through a logical sequence and particular order, we never would have found over $40k in cash (in places that another clean out company would have just discarded without looking, or donated without taking the time to search every nook and cranny). We found an extensive coin collection, cash, some jewelry, sterling silver hidden in a cubbyhole no one knew was even there. We found guns and what I call “uniques & oddities” that were just fascinating to uncover. Imagine us heading into a walk-in attic that was up to our elbows and higher in places! Clearly, the elderly client had not thrown anything away for generations. While the digging part and the smelly part and finding the dead critters part were less than thrilling, someone had to do this for the client; it might as well have been my company. While I was totally focused working in this estate, I had several very important thoughts I would like to share with you. 1. How fortunate for the client, and the attorney representing this client, that they chose a professional who was honest. That cash would have and could have easily disappeared if they chose an estate person who was unethical and unprofessional. When I took that money to the law office, they knew they were dealing with a person of integrity. One has to earn their impeccable reputation. 2. Thankfully, we do have a systematic approach in place to uncover everything. What if we had mistakenly thrown away the cash? What if we never found it and it ended up in the dumpsters? 3. You get what you pay for. If you hire a clean out company that just throws things away, you could be making a grave mistake. 4. For Do-It-Yourselfers: There’s nothing wrong with this approach. However, you can become emotional, creeped out, and overwhelmed, and decide to start throwing items away quickly to get finished. I spend a lot of time pulling things out of the trash that my clients have thrown out, because they don’t know the values. The moral to the story: It took more than one lifetime to create the mess we “un-created” in a little over a week. Most families could never have finished in so short a time if they did it themselves, and would certainly have made unintentional mistakes which could have been costly. Search for and research any estate company you are thinking about using. They are worth their weight in gold if they have a great reputation! It is not unusual to meet with families sorting through an estate on their own and making serious mistakes. Through no fault of their own, they are following their logic. Since they don’t have the benefit of knowing the correct process and sequence of things, knowing the industry, collectibles, antiques, and the overall market, they soon find themselves “guessing” and that is a very bad thing to do. Families, executors, and attorneys hire estate professionals so we can guide the family in knowing what has value, what doesn’t, what is sellable, what is not, options for selling, resources for selling, what to throw away, and what to keep. This is what we Estate Consultants do to maximize proceeds and offer peace of mind to our clients, knowing they are making the right decisions. Let me tell you a story about what just happened. I love sterling silver rings. Besides wearing them, they are a good investment as a precious metal. I had been watching a large lot of rings on eBay and won it at a very fair price. When the rings arrived, I looked at them and found a huge surprise. One ring stood out; I knew instantly it was Imperial jade, and one of the largest pieces of Imperial jade I had ever seen. Even a small slab of this jade is very expensive and sought after. The setting was platinum and not sterling. It was, at the very least, a $1,500 ring thrown in with $5 sterling rings. Someone did not do their homework or did not take the time to do enough homework. I attempted to contact the seller on eBay, but they never replied. Haste makes waste. It is worth hiring an expert to avoid hasty, and costly, mistakes. No one can possibly know everything. Bringing in professional help is an inexpensive insurance policy that you are making the right decisions for the distribution and dissolution of a loved one’s personal property. When I think of a gold digger, my mind conjures up two images: 1) an 1800’s scruffy old man panning for gold, and 2) The Housewives of Beverly Hills, Atlanta, or wherever. In the old days, a gold digger was someone who ransacked the graveyards stealing gold from the deceased. In my world of estates, I see a different kind of gold digger; one that you won’t know exists until a loved one dies or takes seriously ill.
We see estates literally ransacked, like a bunch of coyotes rummaged through the place. Boxes that once sat neatly in the attic and closets are ripped open and left in a jumbled mess, opened with contents spilling out. Closets are left with clothes not on hangers, but in a huge heap on the floor! Kitchen cupboards are askew and I guarantee the silver is long gone. It would appear they left no stone unturned. Were they looking for gold, silver, or cold, hard cash? What is this incessant need for people to take stuff and help themselves? I call them Mr. Pilfer and Miss Pickpocket. They come in, often under cover of the darkness, and things disappear, never to be found again. Is it greed, the entitlement mentality, or just a lack of care and consideration for the memory of the loved one? This just happened in the estate I was working in. The executor, thinking he was being honest and open with everyone, told the family there was cash in the house. You know what happened next? Ransack city. Sometimes, the executor won’t even know there are valuables or cash, but other family members suspect there is money in the estate. It is the executor’s responsibility to protect what is in the estate! No one should go in until all is established and ready to be divided according to the will (if there is one). Hopefully, the executor is honest! Moral of the story: Loose talk makes valuables walk. A parent or grandparent has just passed away, and you are responsible for their estate liquidation. What do you do? Here are the most important practical steps to take, as you begin this process. 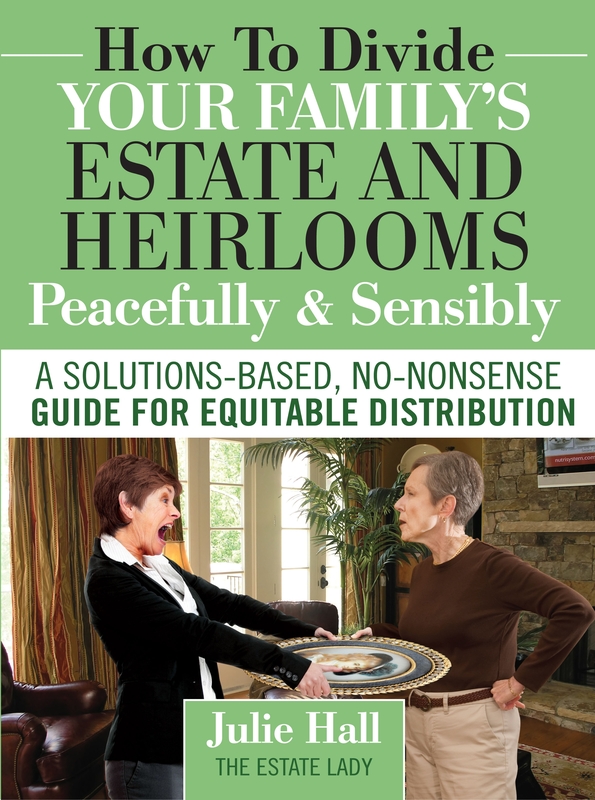 Change the locks on the estate immediately to prevent unscrupulous heirs from entering. While this will ruffle some feathers, it is absolutely the right thing to do to protect the assets from disappearing — and they will. Secure the valuables, jewelry, money, sterling, artwork, etc. in a safe deposit box (if the executor has a safe at home) or other secure location with the understanding that the storage is just temporary. Never leave valuables in a vacant home as it will become a target. Also, this is not an excuse for heirs to “help themselves.” The executor will need to take charge and remain firm. Look for a cash stash. Many people, particularly seniors, tend to hide money in places you would never think to look. If memory impairment was evident, leave no stone unturned because valuable items can surface in the strangest places. But remember too, a loved one with dementia will also give things away. Search for important papers: will/trust, tax documents, papers for house/car, deeds, any inventory or appraisals, anything with family history documented, life insurance documents, etc. Hire a professional certified personal property appraiser who is well-respected in the community to review the contents of the estate and ascertain what has value vs. what doesn’t. The appraiser can also act as a consultant who can advise on the distribution of the contents. They should never offer to buy what they appraise; that’s a conflict of interest. Knowing ahead of time if there will be contentious moments with heirs and if you suspect trouble, get that appraisal report and divide the estate as equitably as possible, unless the loved one left specific instructions otherwise. Whoever you choose to hire, investigate them first by contacting the BBB, ask and check professional references, and make sure their company is registered in the state. Not every company is as it seems. You want a pro you can trust. Q: I have two grown daughters who get along well, and treat me with great care and respect. Now that my husband has passed away, I need to update my will. I am considering both my daughters to be co-executors. Is this a good idea or not, Julie? What do you suggest? A. Have you ever noticed that there are those who are very good at making decisions and those who couldn’t make a decision if their life depended on it? While these are two extreme examples, everyone is somewhere between those two extremes – a mixed bag of opinions, emotions, thoughts, feelings, theories, etc. You never know what you’re going to get when you add different moods and personalities to the mix. Even when you know someone very well, the tide can easily turn when one is grieving and handling an estate, which is a very stressful situation. The slow and steady brother suddenly rears up and causes strife which you did not expect. The quiet, reclusive sister becomes the chronic complainer to the point of estrangement. Another sister is refusing to move out of the home, causing major financial problems for the family. Finally, the long-lost baby brother no one has heard from in years surfaces, demanding his share. One executor is difficult enough, for they can never make everyone happy and are always the target. Having co-executors is not often recommended by legal professionals for these reasons: differences of opinion, geographically remote from the location of the estate, one can easily cause trouble, the other can drag out the sale of the estate against the family’s wishes. You name it and I’ve seen it! I think many people choose co-executors because they don’t want to hurt anyone’s feelings. In the end after they leave this earth, the hurt, pain, and grief that their decision has caused can be unbearable. Bottom line: Think long and hard before assigning co-executors. It may be best to assign this role to someone who is completely objective, rather than either of your daughters. You’ve been chosen as the executor for your parents’ estate, or you’ve selected the executor for your estate. What does the executor do? First, the executor must follow the provisions of the will, which is called fiduciary duty. This is a legal relationship between two parties, bearing the highest standard of care by the executor to the person who requested him/her. The executor cannot do what he or she wants to do, since the court oversees and must approve of the actions of the executor. Second, the executor has to complete all the responsibilities of his/her role. Even if you are disappointed that your sister was chosen as the executor instead of you, maybe you should be thankful. Being named an executor carries huge responsibilities that cannot be ignored or shirked. The best thing you can do, if you are not the executor, is to support the person who is! Next, the executor has the responsibility to secure any valuable belongings, including the house, until they are distributed. Locks should be changed immediately on the house, garage, and any outbuildings or storage units. If there are valuables, like jewelry, that should be protected further, the executor may remove those from the house for temporary storage. In both cases, all heirs should be notified of the changed locks and the offsite storage of valuables. Everything should be documented. Further, the executor should locate all important papers, including the will, financial records, master list (if one exists), and important contact information. These contacts would include the estate attorney and financial planner or accountant. Finally, the executor handles the equitable (hopefully!) distribution of the decedent’s assets, according to their stated wishes. This involves much communication, promoting harmony between heirs, and navigating the minefields of relational issues that creep into this process. Appreciate the executor of your estate, and prepare as much as you can in advance. There is no substitute for good records and good communication!